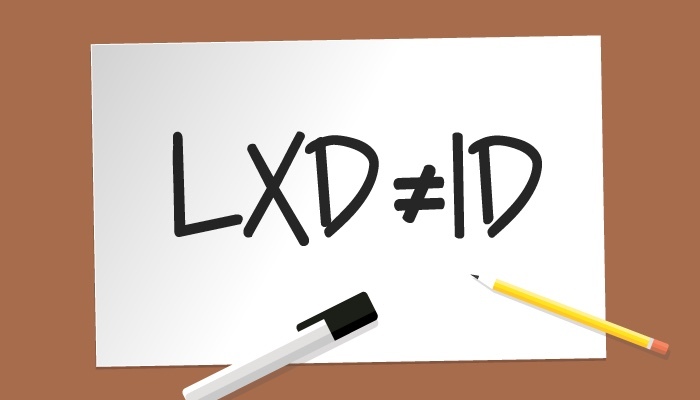 LX design and Instructional design are two different fields of expertise. While some instructional designers argue that LX design is simply a new form of instructional design, I would argue it’s not. Here’s why. A clear difference is the use of instructional experience versus a learning experience. Putting the emphasis on the instruction and the instructor (or trainer, teacher, facilitator) is quite different from focussing on learning and the learner (student, trainee or participant). Putting the instructor in the center of the experience is still common in education. LX designers always put the learner in the center of the experience. This results in a different design where the needs and preferences of the learner are leading. Obviously, they are both called design disciplines. However, instructional design is a very different type of design discipline than LX design. This has a lot to do with their origins. The history of instructional design goes back to the army in the middle of the 20th century, where instruction was literally of vital importance. The basic idea was to make instruction as effective as possible by using, amongst other things, behavioural and cognitive psychology. Over time this evolved and became part of our educational system. Instructional designers are taught to work within this system using a systematic and rule-based approach. Their expertise is choosing the right technology for content delivery and method of transfer. LX design has only been around for just over a decade. It is rooted in a variety of design disciplines like interaction design, user experience design, game design and graphic design. A learning experience designer combines these design skills, tools and methods with theoretical and practical expertise about learning. LX designers use their creative freedom to explore and design different kinds of learning experiences. This freedom is in part due to the creative and artistic nature of design but also because LX design comes from outside of the tradition of our educational system. Instructional designers are looking at lx design as a way to enhance their services which is great. This is something I encourage because I believe LX design will help anybody, instructional designers included, to deliver better learning experiences. But to argue that LX design is basically the new name for instructional design doesn’t make sense. I have met and trained instructional designers myself and there are fundamental differences between who I am and who they are as a professional. My point here is not defend LX design or attack instructional design, it is to show how they are different. And ultimately to celebrate both what we share and what makes us different so we can learn from each other.